Last Friday we (finally) received the check from our insurance company! After 89 days of waiting, we finally felt like we were making some progress toward replacing the floors and carpet. Todd and I spent Saturday afternoon at Home Depot ordering the carpet and vinyl flooring that we picked out months ago. It should come a few days after Thanksgiving. The kids and I are planning to leave for our trip to Florida a few weeks after that. So as much as I don’t want to spend any more time with concrete floors, we have decided that it will probably be easier and much less stressful for all involved (okay, mostly me) if we have it installed while the kids and I are gone. I’m sure the installers would prefer not to have Micah supervising them and Mark trying to help them. We don’t know yet whether this will work out for us to schedule the installation then, but we are hopeful that it will. This will mean a lot more work for Todd while we are gone, but it might break up the monotony for him, too. (Although I think he might be looking forward to some monotony after the last few months, I know I am.) In the meantime, I am trying to get as much cleaned out, cleaned up, and packed up as I can so that there is really only furniture left to be moved out the the way. The main project that we need to finish before we have the carpet and floors installed is the closet in Maggie’s room. (Which will be a general purpose closet. Although it will sit inside the perimeter of Maggie’s room, but it opens into the living room and the back of the closet will create a solid wall–instead of just doors–between her room and the living room.) 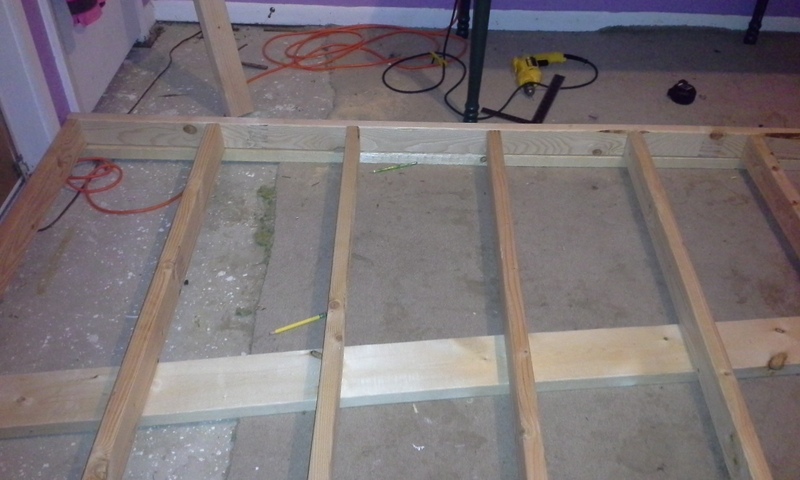 Today Matthew and I started work on framing the long (back) wall of the closet. I have built a few things, but have never framed a wall by myself before. So far it has gone really well. We are a little over halfway done nailing the studs to the base plate, so we are hopeful that we will be able to finish the long wall tomorrow and start on the short wall. Here is a picture of our progress–and our mess.